Notes: This is comedian Totie Fields' first TV sitcom role. She overpowers anyone who is in a scene with her. Lucille even allows her a song at the finale to showcase her musical abilities. Fields' television work will almost always be confined to game shows, talk shows, dramas, and variety shows. Notes: Jim Baily impression of Phyllis Diller is dead-on. Notes: Eve Plumb is much more recognizable to television fans as Jan Brady on The Brady Bunch (1969-74). Donny Osmond really did have a crush on Lucie Arnaz. Notes: This episode is based on the 1952 I Love Lucy episode #30, "Lucy Does a TV Commercial", the famous Vitameatavegamin outing. This time Lucille overreacts to the tast of sour pickles as she rehearses her lines over and over. Notes: The slapstick comedy scene with the custard machine going crazy is classic Lucy. 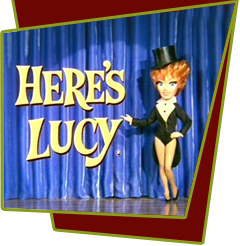 This entry is based in part on The Lucy Show episode #7, "Lucy is a Kangaroo", which is itself based in part on the unproduced 1961 special, Lucy Goes to Broadway. Notes: This is the largest part Vanda Barra will have on a Lucy episode, and it showcases her to great advantage. Under different circumstances, she might have been a good replacement for Vivian Vance. Notes: This is the third retrospective show Lucille does. It was planned to be the last show of the series. CBS President Fred Silverman comes to Lucille's house in Beverly Hills and talks her into doing another year. The script is slightly reworked so that as Lucille walks out of the office at the end of the show, she leaves a sign that says 'Temporarily' Out of Business. Notes: It was about this time Lucille began relying totally on cue cards. In the beginning of Here's Lucy, she not only knew her lines but everyone else's. She wanted to observe what was going on without a script in her hand. The more she used the cue cards, the less she was in the reality of the scene.